There are currently two types of residual questions about marijuana. Some are genuine and understandable, given the difficulty in comprehending the underlying medical and social realities. Other questions, however, take on a different cast. Some persist, even though the answers have been long available for those who asked with an open mind and followed the evidence. In some cases, it would appear that we are not dealing with genuine questions, but rather an advocacy stance, which is to defend a position driven by political imperatives and in the face of evidence to the contrary. Nevertheless, it is necessary to answer both types of queries, setting forth the persistent myths concerning marijuana and its impact on the criminal justice system and its consequences for public health, and then counter-posing those myths against the known facts. Obstinacy in the face of the facts certainly plays a prominent role in the argument over marijuana’s legal status. Time and again in debate the same charges are brought forward, however false, and correcting them publicly seems to change nothing. For instance, there is commonly the argument that the laws against drugs do more harm than good, the evidence being that prisons are filled with low-level non-violent marijuana users, with a particularly unjust impact on minorities. It follows, for advocates, that making marijuana legal should remedy a host of injustices in the criminal justice system and free us from unnecessary costs, without endangering public health. A review of the actual criminal justice realities, as well as the medical facts, support none of these claims, no matter how politically effective it has been to make them. Medically, confusion and contradictory claims mar our understanding of marijuana’s health risks. Some argue that the drug, used in moderation, is benign. Others see considerable damage already in evidence, and the portent of far worse as potency and exposure grow. At this point, nearly everyone grants that there is great risk in one scenario: heavy use in early adolescence, particularly for the vulnerable, wreaks havoc, and may be irreparable. At best, such use threatens the future well being of any vulnerable youth. Given the widespread acknowledgement of this risk, it remains troubling that some marijuana marketing in Colorado, under recreational legalization, nonetheless targets this very population of the vulnerable, against all assurances to the contrary given at the time the policy was presented to the public. Perfidy aside, there is almost uniform agreement that for one type of user—developmentally young, genetically predisposed or with prior mental susceptibilities—using heavily forms of marijuana with excessive doses of THC is catastrophic, and perhaps permanent in the damaged caused and should be prohibited. But regarding scenarios other than this one case, whatever agreement one may find splinters. For other, more common types of users, arguments have assumed little damage from casual or occasional marijuana exposure, begun perhaps in young adulthood by otherwise healthy individuals, particularly use that tapered off as adult responsibilities led to changing drug use habits. Recent evidence from brain imagery, however, now challenges even this assurance of relative safety. Casual use among young adults, neuroimagery shows, alters brain structure and function in a manner that has been heretofore undetected.1 If this research is borne out, the implication is that there is no safe dose, for anyone. The overall risk from marijuana further depends on whether or not one takes seriously the implications of the “gateway” hypothesis, which is the claim that heavy marijuana exposure predisposes to the use of additional drugs, expressed as an increased risk or probability for subsequent use of drugs such as cocaine or heroin. 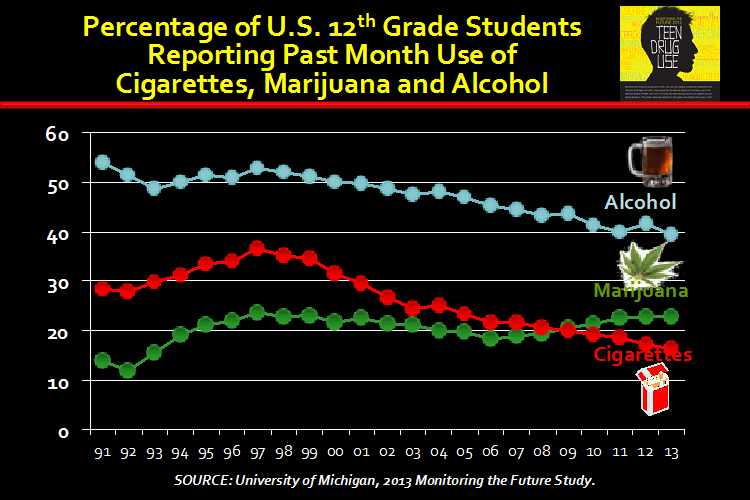 If the “gateway” represents a correct understanding of the science, the actual epidemiological impact of youth marijuana use would be magnified substantially. Further, it follows that marijuana policy should then be seen as a critical factor in countering the entire pathology of unquestionably dangerous substances. For instance, the Washington Post reported on a recent study by Dr. Wayne Hall in the journal Addiction, summarizing 20 years of research on adverse health effects from marijuana use.2 The summary included conclusions about the validity of the marijuana “gateway” hypothesis, which the Post largely dismisses. The Post concludes with the line, “Many researchers suspect that to the extent there is a gateway drug, it’s tobacco, not marijuana.” (“No, marijuana is not actually ‘as addictive as heroin’” October 9, 2014). Aside from being an illustration of the inclinations of some in the press to underplay the risk from marijuana, this account is also revealing about the lack of willingness of Post reporters to read carefully the studies upon which they comment. If they had read the actual Hall article, for instance, they would indeed have found a passing reference to tobacco. But it leads to the opposite conclusion from the one posited by the Post. The increasing potency of the marijuana as expressed in the dose of the neurotoxin THC. The implication is that the earlier the study, the lower the potency, and hence, the less reliable the findings for understanding the risks from exposure today. That is, some studies finding little damage are no longer relevant when compared to the dosage encountered by users today (and the changing circumstances of youth initiation); the sheer concentrated quantity of THC may make of marijuana a qualitatively different and more dangerous drug than in previous decades, and only the most recent research captures this true risk. Nonetheless, it is easier now to grasp why so many advocates for legal marijuana seem self-assured that the damage has been overblown, or even hyped by government fear-mongers. They are mystified by the claims of considerable risk, and distrust those who bring that message. The advocates have known too many casual users (or may even have personal experience with the drug) and because they do not detect obvious manifestations of harm among their associates, assume that there has been none. In reality, it now appears that damage is nonetheless present in a wide population of those previously exposed to even low-potency THC, and the damage can be found in the absence of other risk factors and among those commencing use post-adolescence. (Albeit, the damage may be subtle.) A recent article in the New York Times summarized this research and its implications well (“This is Your Brain on Drugs,” October 29, 2014). What has changed today is that research methods and tools have become more capable of detecting the impact even in these conditions of casual exposure, and the message from the last decade has been more troubling and more confirmatory year by year that the drug does harm, regardless of the level of exposure. Finally, there are some areas of impact that researchers weren’t expecting and hence did not examine. Examples can be the recent findings regarding cardiac episodes among young and otherwise healthy marijuana users. Because a link to their marijuana use was unexpected, physicians were not seeking that relationship, but as the evidence begins to mount, they are now finding more reasons to suspect that marijuana use has been implicated in some cardiac conditions all along. Similar discoveries of other unsuspected effects in areas such as behavior, memory, emotional problems, attention deficit, and learning are even now being confirmed by research that is more careful and able to disambiguate the impact of the drug from confounding, non-drug social or personal circumstances. In general, it is important to follow the broad trajectory of marijuana studies. Over the decades, the research has contended with a shifting landscape, with a multitude of variables changing almost simultaneously. The drug itself has changed, with potency spiraling upward and the relative proportion of the various “cannabinoids” found shifting towards a preponderance of THC over other compounds. The circumstances of its use have changed, becoming not only more widespread but also more regular and frequent, just as the age of principle use has declined in recent years. The social forces for legal acceptance have changed, becoming more insistent and well-funded, while pushing misleading information, including claims of medical efficacy for the drug, that have clouded public (including media) perceptions. The methods and tools of science have changed, becoming more acute in detecting damage, and at an earlier stage, than previously, just as researchers have found ways to control for and counter alternative explanations for the results. With regards to nearly every early worry, the subsequent literature has moved in one direction: confirming and justifying the concerns, and widening the scope of the drug’s impact on the mind and body. The earliest findings were often based on animal models of the brain, but they have now been supplemented by numerous human epidemiological studies, including those longitudinal in scope (following users for many years into adulthood), or involving twins, one of whom used marijuana while the other didn’t (discordant twin studies). The case for damage keeps getting stronger and more comprehensive. Further, many plausible alternate interpretations have been explored, and many, if not most, have been shown to be inadequate to account for the persistent results. Though advocates posit explanations such as “pre-existing conditions” for which marijuana use represents “self-medication,” or that stress the social dimensions of poverty or stigma to explain educational failure, or that look to concomitant use of other drugs or alcohol that might account for the damage, research has addressed these possibilities and adjusted for their potential impact. Researchers have explored the proffered alternatives, and either by study design or statistical correction been able account for, or dismiss, the putative alternate “explanation” for the effects. What remains is stronger evidence for seeing the drug itself as the major factor. That is, it becomes harder and harder to evade the fundamental truth about the drug, as plausible but unlikely alternatives are systematically ruled out. Still one hears advocates argue that all we are seeing is correlation, and not causation. Or they continue to postulate factors and variables of a social or an economic nature, seeking to explain away the otherwise troubling results. The point is that researchers are bright people, and by and large they have thought of these possibilities, and where possible, controlled for them. After these adjustments, it is the effects of the drug itself that continue to manifest and explain the outcomes. Importantly, it is the cumulative record of results from so many areas of medical science—from animal studies to human neuroimaging to mental health disorders to cognitive impairment and to social and educational outcomes, that taken together leads to our conclusions. Correlation is not causation, granted. But multiple and consistent and comprehensive findings of correlation, statistically robust, combining behavioral outcomes with evidence of underlying brain transformations, each persisting after control for potential confounders, become in their totality convincing for all but the most resistant advocate. To believe that marijuana use is safe is to be deceived. To believe that legalizing marijuana will make America a better, more just nation represents the end stage of Reefer Madness.